Written By: Delicious Israel Blogger, Rebecca Kazhdan. Recently, I was given the treat of joining Inbal at the opening of the Dan Gourmet School of Kosher Culinary Arts. The high-class hoteliers have branched out to open a $2 million center giving aspiring chefs and home cooks the opportunity to take out their knives and sharpen their kosher skills. Arriving at the entrance of the ORT Trade School in Yad Eliyahu, we were greeted by several well suited security guards and equally well dressed guests – not something I often encounter living in Tel Aviv. Correction, something I have never encountered living in Tel Aviv. After receiving our security clearance we walked into a nicely decorated white entrance room where a chef was preparing a very tasty mallard and sweet potato salad. We continued on to a hip outdoor patio that housed the bar and some well graffitied walls. 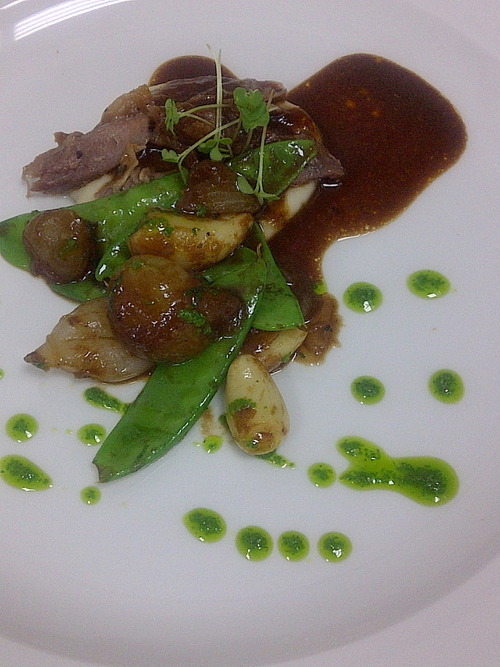 Another chef was serving pastry dough filled with lamb, quince marmalade and a sauce of wine and silan – unusual flavors that came together to create a delicious bite. Wine glasses in hand, we headed inside where a podium was set up for the various speakers that had come to support and help unveil Dan Hotel’s latest venture. The room had several additional chef stands and I learned that all of these chefs had come from Dan hotels all over Israel to share their talent and make the delicious food we were lucky enough to taste. The security clearance started to make more sense as speakers such as Stas Misezhnikov, the Israel Minister of Tourism, and Ami Hirschtein, President of the Dan Hotel Chain, expressed their excitement and wished success to the school and its future students. 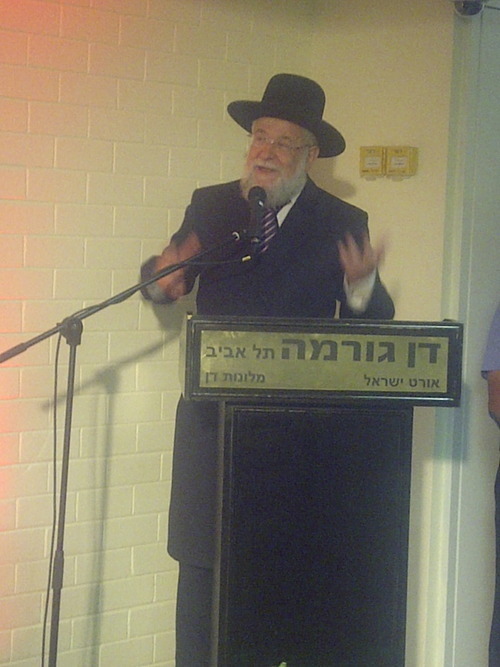 The speeches were concluded by Rabbi Yisrael Meir Lau, Chief Rabbi of Israel, who provided his blessing as he hung the mezuzah. We continued our culinary tour of the school and entered a huge room where a number of chefs were spread across stainless steel stations working with state of the art equipment. We filled up on tasty bites like Jerusalem artichoke, beef filet and ravioli, goose confit accompanied by Asian flavors and black tea smoked salmon. Unfortunately, we didn’t get the memo that dessert would be served. Stepping into the dessert room was like walking into every child’s fantasy. 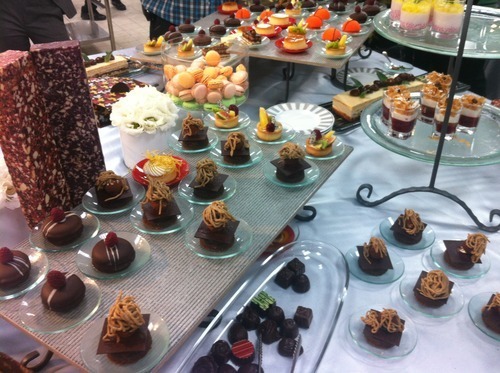 Over fifty desserts were beautifully displayed across the room. Being true foodies, Inbal and I took up the daunting task of trying each and every one. My favorite was a tart with figs, dragonfruit, raspberries, kiwi and pineapple. 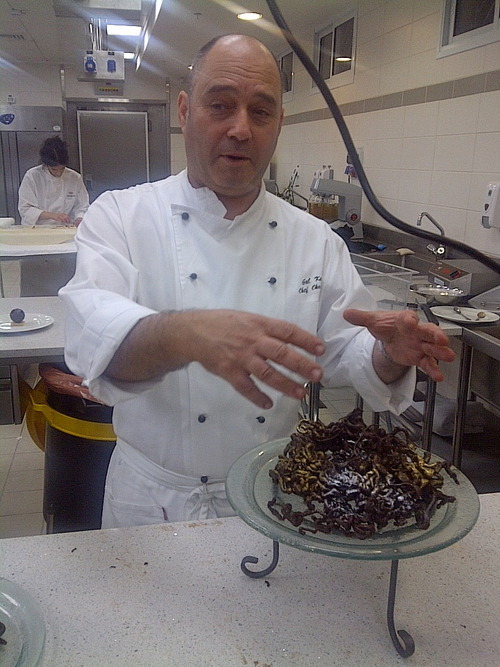 Inbal favored a decadent pastry with chocolate and pistachio. The sweet end note left us happy and satisfied. The night showed me that the Dan Hotels have used their impressive reputation and brand name to create a Kosher friendly culinary wonderland that is waiting for culinary students, foodies and anyone interested in cultivating their skill!